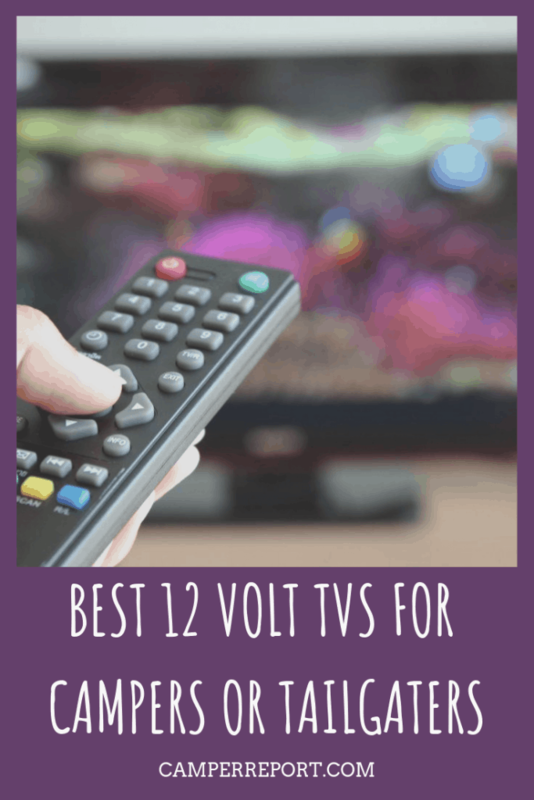 After having several “Travel TV’s” growing up, I have some opinions about what 12-volt TV’s are winners, and what TV’s are losers. So what’s the best 12-Volt TV for your camper or tailgator? The best 12-Volt TV is the AXESS TVD1805-22 22-Inch 1080p LED HDTV. This TV is made of quality parts that will last and is equipped with an HDMI and USB port, as well as a built-in DVD player. Interested in learning more? If you want a couple more recommendations and tips, read on! As stated earlier, I really like this TV. There are a few size options that you can choose from which is great, and it meets all of my criteria for a portable TV. Size – Some TV’s are just too big to lug around in a travel trailer, truck, or another camping vehicle. Generally, you are going to be sitting close to it anyway so you really don’t need a 40-inch flat-screen anyway. 1080p – Most people know what this means, but I will explain it anyway. a 1080p screen has been the industry standard for a decent TV or computer monitor for several years now. 1080p means that the TV is one thousand and eighty pixels tall, and will display things in full HD. Roku/Amazon fire stick capability – This is a must for me, but only matters if you are going to a place that has WIFI or if you have a decent hot-spot. Most of the time, a Roku, Amazon fire stick, or Google Chrome cast just need a USB to power them, and this TV already has one installed. External Hard-drive capability – If you have a hard drive full of movies (that you obtained legally), then you want a TV that can play those. This TV has a USB port so that you can plug your drive in and watch all of your completely legal television! Price – Putting a TV in your RV or Truck can get expensive, and this TV is on the cheaper end of the options you have. Getting a TV like this is the simplest and one of the cheapest solutions you can have. One thing people have said is that the sound isn’t the greatest, and you might need a set of small speakers to get the desired quality you want. Supersonic has a TV that competes directly with Axess. This TV has all the same features and comes in plenty of sizes. Size – The Supersonic comes in plenty of sizes, all varying in price. The price fluctuation isn’t much though. 1080p – As I said before, on a TV I require it to have at least 1080p or more, so this TV meets my standards. Roku/Amazon fire stick capability – An HDMI port and a USB cable for power mean that it can have a Roku or Amazon Fire Stick plugged in constantly. you might need a WIFI hotspot but you will be able to stream Netflix. Netflix is great, and you don’t want to miss it. External Hard-drive capability – Another win for the Supersonic. It has a USB plugin so it will work with your hard drive full of home videos. Price – This TV is a little cheaper than the Axess, coming in at around $140. That being said, I am lead to believe that the Supersonic is made from less durable parts according to reviews. On paper, this is a great TV, but it is just less consistent than other models. If you are only really planning on using this once, then it might be your best bet. Mountable – This TV is able to be mounted somewhere in your RV, or on some sort of tripod if you are willing to risk that. Jensen makes plenty of products, but this one stands out. These are designed specifically for RV’s and trailers. Size – The Jensen JTV24DC is a great size of 24 inches. 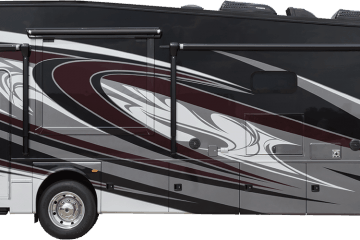 24 inches is about as big as you want to get in a medium sized RV. 1080p – Full HD makes everybody happy. Roku/Amazon fire stick capability – This TV has both a USB port and 2 HDMI ports, so your Roku will work great. External Hard-drive capability – It has a USB, but some people complain about it not playing all of their videos. Price – This TV is around $220, so its the most expensive on this list. I think it is well worth it if you want an excellent picture. Mountable – This TV is able to be mounted somewhere in your RV if you purchase some sort of mount. Most every 12v TV has a place where you can plug it in directly to your cars 12v adapter. That means setup can be really easy. The problem is generally the length of setting it up. Nobody wants to sit in their car or camper when they have a tent that is probably much more comfortable and roomie. Hopefully, with that extra 16 feet, you can run your TV cord from under the hood of your car directly into your tent. That sounds like a fantastic evening for just about anybody. The next thing people normally worry about is “How long will my battery last? With a fully charged car battery, you can watch for about 4 hours before it dies. That being said, you probably don’t want to kill your battery. I recommend only watching about 2 hours before topping off your battery with a drive into town or something similar. There are several different types of batteries out there that will work better than the standard battery that you have in your car, and it can get a little complicated. Other than that, its pretty simple to set up. Basically a “plug and play” system. Bring some of your families favorite DVD’s along and you are ready to go! My recommendation for having a TV in your tent is to make sure you don’t fall asleep and kill your cars ability to start. Set an alarm on your phone or something. Something to prop the TV up is also a must, but I am sure you will find something. A box is often all you need. Do These TVs Need a Special Battery? A normal car battery will work fine, but a deep cycle battery will do much better. What is a deep cycle battery, you ask? Your phone’s battery is a deep cycle battery, meaning it is meant to be taken all the way to 0% charge and then be charged all the way again. It can recharge hundreds of times before wearing out. Deep cycle batteries normally have less power output, but will last much longer than a standard car battery. Is running my TV off of my car battery bad for it? As long as you don’t run your car battery down to 0%, it shouldn’t harm it to run your TV for a little while without your car running. 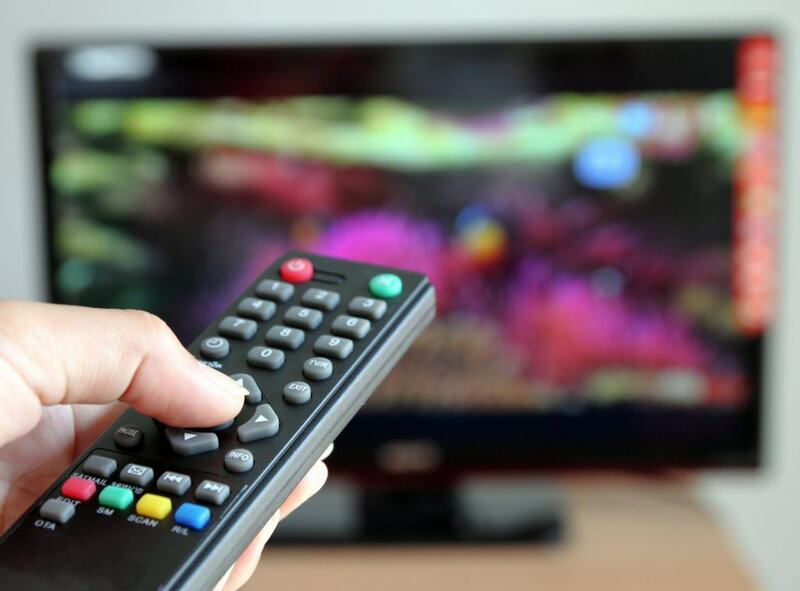 If you have a deep cycle battery, you have the potential of running your TV for a full 20 hours. That is nothing to scoff at. A deep cycle battery is definitely the best option, and I recommend getting one unless you get a tablet or something with its own battery. You will be much happier if you do. If you don’t want to lug around another battery, then you can use your car battery. Just be careful! In the day and age that we currently live in, a TV setup might not be your best option. When I was living in a trailer, I found that something small and movable has a lot more value in a cramped space than a stationary TV. A large tablet will always trump a TV, in my opinion. A huge tablet is much more mobile and can serve many more purposes in the “entertainment” department than a TV. When you are in a small space such as a tent, truck, or RV, minimalism is really important. The key to minimalism is quality over quantity, and therefore a tablet is much better than a 12 volt TV that will take up a lot of space. Having a tablet is just more convenient, especially when you can charge them via a cable from a 12v car adapter like this one that I own myself that has IQ charging, which is crazy fast. The iPad Pro, for example, has a 12.9-inch display, which some may say is small for a TV, but it has double the screen resolution of a 1080p screen. That means it can be close to your face and you still won’t be able to see the different pixels. The Samsung Galaxy View is a great Android option and sports the biggest screen on any tablet I have heard of with an 18.4-inch display. They are marketing this as a tablet designed to replace small TV’s. With its size and 8-hour battery life, this tablet will let you watch whatever program you want with ease. A tablet mount is a necessity for using a tablet as a TV. The type of mount you get really depends on what type of surface or area you want your tablet to be shown. I recommend this one. Although much more pricey than a TV, these guys have so much more capability, and you will use it much more. A simple subscription to Netflix actually allows you to download movies for situations just like this. Download several movies or seasons of your favorite TV show and you will be ready to cozy up next to your family in your tent or truck bed for some good ol’ television. Having a TV is great and all, but sometimes it can be more of a pain than its worth. Some of my favorite camping trips have involved an outdoor movie projected on a bed sheet. Maybe one of the new generations of mini projectors would fit you better? If you are like me, you enjoy camping for the beauty of nature, not because it’s hard or uncomfortable. I enjoy being comfortable, therefore I enjoy things that make me feel at home. These mini projectors will make you feel like you have your home theater system wherever you go. The Nebula Mars Lite Portable Cinema is another great option for camping/tailgating. This bad boy has 3 hours of battery life, great sound, and a fantastic picture. You could have a TV, but honestly, that is pretty cumbersome. Why not get this bad boy and hook it up to a laptop and project it on a bed sheet. I have so many memories of outdoor movies, and so will you if you choose this option. Chances are, you probably want to watch more than three hours, and this doesn’t have any 12v capability. A cheap adapter will do just fine to give this bad boy power in between uses. Of course, if you don’t have anywhere to hand a bed sheet, you aren’t going to get much use out of something like this unless you have a projector screen. My recommendation for those that only have cars is to run a line across 2 trees and hang a sheet from there. It is also important to note that these don’t look great during the day or in bright spaces, so tailgaters might not enjoy something like this because they simply will not get the picture that you desire. This will get your temporary camping or parking lot neighbors jealous really quick, and chances are they will be coming over to watch as well. Just be courteous and keep the very loudspeakers on this thing to a minimum at night! If you are the type of person that loves to go tailgating, then a mobile TV is the best addition to your party arsenal. Having a game showing on your tailgate while you eat some burgers and hot dogs is the best way to get excited about an upcoming ball game, and I am sure that is why you are here. Setting up a truck to do this is actually really easy. All it takes is one of these 12v TV’s that I have already recommended, probably an extension cable of some kind, and either a game on DVD, USB, or a cable antenna. Grab some sort of mobile antenna to access the local channels, place your TV on the Tailgate of your truck or hood of your car, run the extension cables under your hood and you should be good to go. Be careful not to exhaust your battery, but you should be good to run some of your favorite sports highlights before the game. If you wanted to get a group together to watch an entire football game on your fancy new set-up, it might be best to find yourself a “deep-cycle” car battery, which will allow you much more watching time. 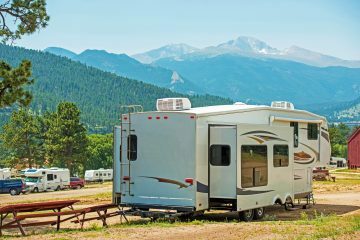 When you are setting up a TV in a trailer or motorhome, placement is everything. #1: Where will we want to watch TV? This is pretty self-explanatory. If you are the type of person that wants to watch TV from the same place that you sleep, then mount it in view of that. If you are the type that wants an outdoor viewing experience, then there are options for that as well. Maybe you don’t want to mount it, and that is fine too. #2 How long are the cables on our TV and where are the ports? It is important to know how much reach you have before you start drilling for your mount. Otherwise, you might end up with more holes than you intended. #3: Do you have a speaker system in your RV? This is important if you want the sound for your movie to go through your RV sound system. If you do, try and place your TV so that you can view it from where your sound is loudest. This isn’t the most important thing, but it sure is a factor. #4: Will you have access to the ports? Sometimes people mount their TV in some sort of nook or cranny, making them unable to plug anything in! Take the time to do a trial run before drilling any holes. #5 Do you have a place to run your antenna? 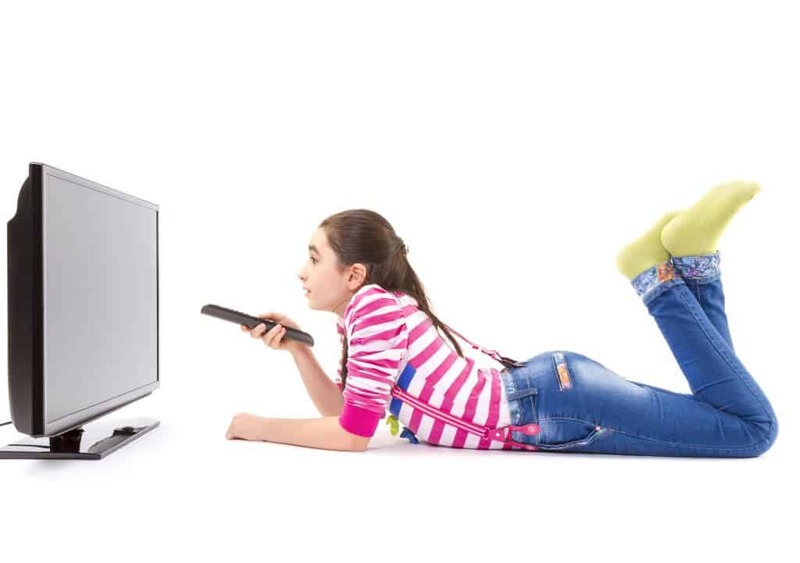 If you are trying to connect to local channels, then you need a place to put the antenna that will help you get the best picture possible. Make a plan for this. Can RV’s have wifi? To obtain Wifi in an RV, you need a Wifi hotspot device sold my several carriers in the U.S. or some sort of Satellite internet system with a Wifi router. This can be done but is expensive. Can solar panels power a TV? – Although most consumer grade solar arrays cannot power a TV, if the solar panels are used to charge a deep cycle battery, then the TV can run off of that charged battery.